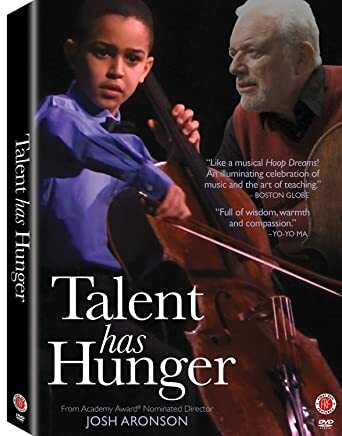 Talent Has Hunger - BUY THIS DVD! Talent Has Hunger is an inspiring film about the power of music to consume, enhance, and propel lives. Filmed over 7 years, the film is a window into the mysterious world of the artist, the passion that can grip and sustain a young player from childhood through the last days of life and the years of sacrifice and dedication a budding artist needs to fulfill one's talent. The film focuses on the challenges of guiding gifted young people through the struggles of mastering the cello. Through the words and actions of master cello teacher, Paul Katz, it's clear that this deep study of music not only prepares wonderful musicians, but builds self-esteem and a cultural and aesthetic character that will be profoundly important throughout his students' lives. THEN SEND IN A COMMENT ABOUT YOUR FAVORITE FUNIMATION TITLE (you may click on artwork above for a refresher) PLUS YOUR NAME AND ADDRESS TO contests@efilmcritic.com or WeLoveHBS@aol.com. (Just one e-mail please.) Put [b]"DAD, PULL OVER TALENT IS HUNGRY" in the subject line and cross your fingers. We will draw names and one of the prizes could be yours. Only 1 entry per household.